One can conquer a fear and it indeed feels good, but unfortunately it comes back! True Rosemary! But perhaps after confronting a reoccurring fear, the fear will become less daunting and have less power. Something to think about. I try, nearly had a bad experience as a result, know it is illogical, but it keeps on recurring. Hi Lisa, A habit can be broken. I was always fearful of doing something new. UNTIL the minute AFTER I did it. Sometimes we have to push ourselves outside of our comfort zones to experience what life is all about. I challenge you to do the next thing that ‘scares’ you! Let me know when this happens, (and what fear you overcame) and I will send you a framed, ‘I am proud to be a Recovering Doormat’ 8 x 10 poster. Do we have a deal? 🙂 <3 Rose G.
Deal, lol! It shouldn’t take long because I have avoided a hell of a lot of things in my life. Great! 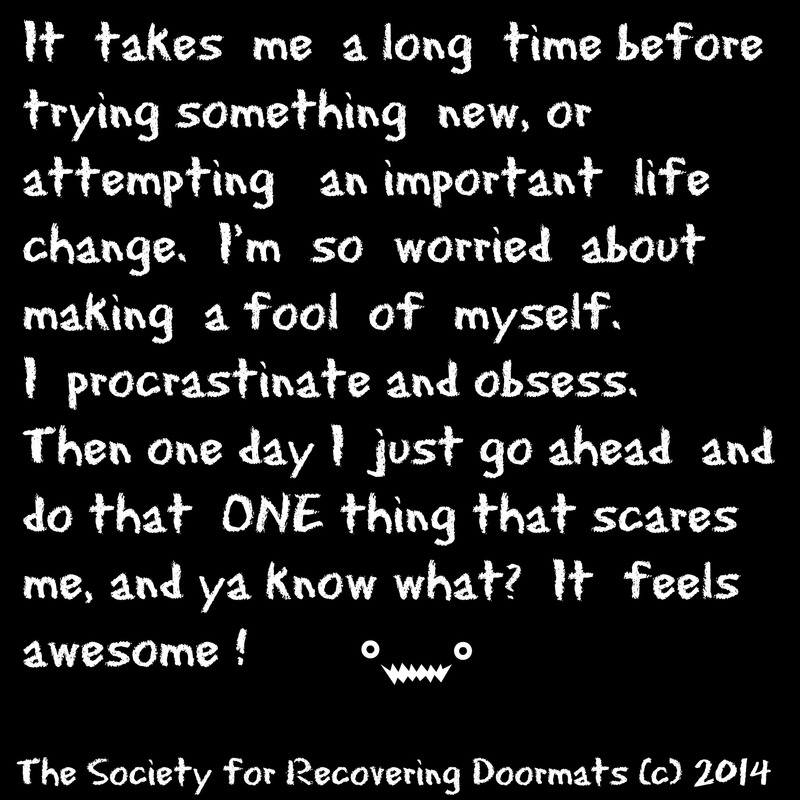 Send your address to my private message box on The Society for Recovering Doormats FB page. If you don’t do Facebook, then we will try another way for you to share the mailing address with me and not the entire internet world. LOL. BUT FIRST ya need to do that one thing that scares you. Good luck. 🙂 Rose G.
All the time! Then I realize that the Dragons were chasing me around and I turn and chase them! It DOES feel good. You get how it is!